Experience a Hawaiian paradise with a true feeling of home. 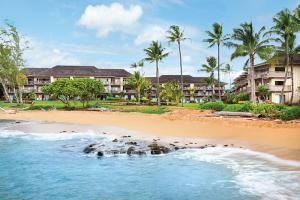 This condominium is nestled on a lush beachfront setting along Kauai's Coconut Coast. Each spacious one- or two-bedroom unit is finely appointed with a fully-equipped kitchen and attractively decorated with its own private lanai. A calm ocean pool invites you to relax in the refreshing sea. Shopping and dining are just steps away at the Coconut MarketPlace. On the beach in the Wailua River area, 7 miles north from Lihue, centrally located between the south and north shores.